Whether used for crystal ball gazing (scrying), aura cleansing, meditation, rituals or as adornment to a room, crystal and gemstone spheres radiate special energies that are created from the earth itself! Each stone contains energy that is unique to the type of stone. Getting to know the properties and benefits of thousands of stones can take a lifetime - but is a rewarding and fun adventure. I invite you to study crystals and gemstones, their origins, folklore and current day uses. I have included a short list of some of the uses of gemstone spheres in the right column of this web page. Explore the meaning of gemstones and get creative with spheres for your specific purposes. Meditation: A gemstone or crystal sphere can be used during meditation. You may want to hold the sphere or just gaze upon it when meditating. Healing: Crystal healing should be done by a professional and in conjunction with traditional medicine. Find a professional in your area who offers a workshop or seminar. Decoration with a purpose: Place a gemstone sphere in a room or on your bedside dresser or office desk to emanate a particular energy that you feel is needed. For example, a rose quartz sphere at your bedside surrounds the room with love. A crystal ball will cleanse the room of negativity, while a jasper sphere will emanate protection. Bring money to your business with a malachite sphere on your desk. Increase your luck with the stock market with a black tourmaline sphere. Crystal Ball Gazing: A Crystal Ball used for gazing should be kept wrapped in black silk. When using the Crystal Ball for gazing it is best to hold the Crystal Ball in your hands with the black silk between your hands and the Crystal Ball. You may use a stand for the ball if you find holding the ball uncomfortable. You must experiment to find what time of day or night is best for you. You must relax and sit passively. Make sure you are comfortable. Take several deep breaths. You must have patience. Concentrate on a question. Often colors are seen the Crystal Ball. Green, blue and violet are excellent omens. Red, orange and yellow are negative omens and you must take care. Black is unfavorable and much care must be taken until it is no longer seen. A white brilliance is very favorable for you, meaning your life is on the right track and will be improved. 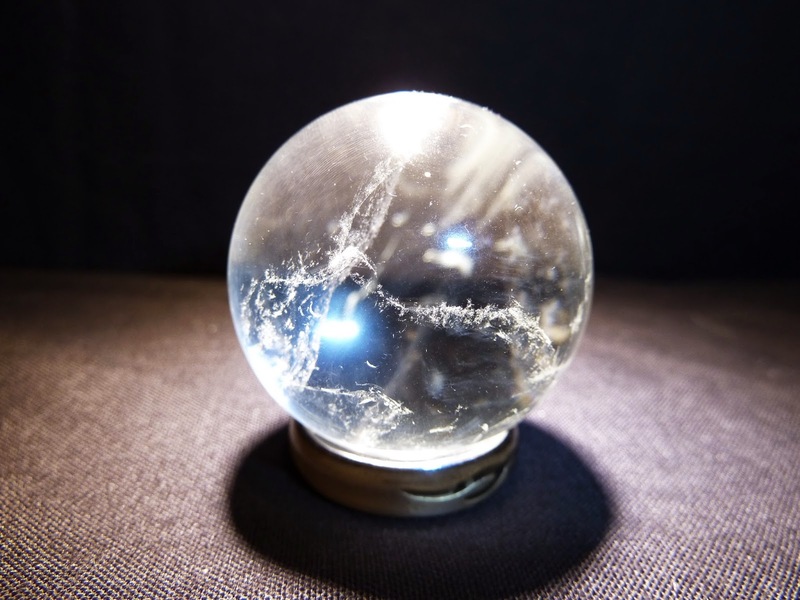 You may see movement or even visions in your Crystal Ball.